(KPL) On November 1, 2018 the United States government formally handed over information technology and equipment to senior officials in the Anti-Money Laundering Intelligence Office (AMLIO) of the Lao PDR. The U.S. Embassy presented the equipment to AMLIO Director General Madame Phengsy Phengmuong in the capital. Also attending the ceremony was Ms. Ekaterina Koposhilko from the U.N. Office of Project Services (UNOPS). The donated equipment consisted of computers, tablets, and printers to improve AMLIO’s IT capabilities and help them with their work in anti-money laundering and countering financing for terrorism. 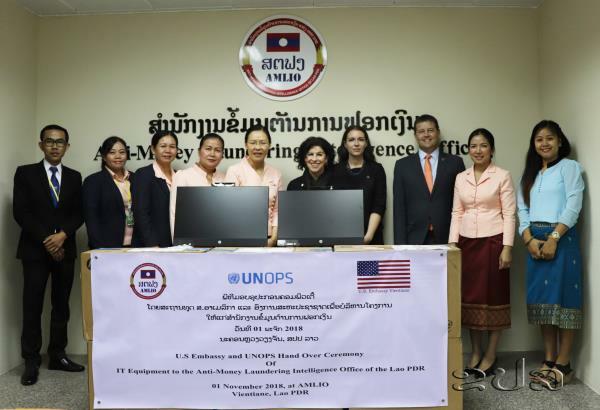 This equipment is part of the U.S. Embassy’s ongoing support and collaboration with the government to combat money laundering and other illegal activities in the Lao PDR. The project is being implemented by UNOPS, and it supports international training for AMLIO technical staff, legal support for the drafting of decrees and regulations, and consulting services of an IT expert who specializes in IT systems for Financial Intelligence Units such as AMLIO. According to Ambassador Bitter, the U.S. is pleased to be partnering with the Lao government and other partners, such as the United Kingdom and the U.N. Office of Drugs and Crime, to help Laos strengthen its domestic efforts to counter money laundering and combat financing for terrorism. “AMLIO’s work directly supports the U.S. and Lao PDR’s shared goals of combatting crime and helping to further integrate Laos into the ASEAN Economic Community and the global economy,” said Ambassador Bitter.